When designing Email Messages, Merge tags allow users to add a personalized touch to their emails as well as provide dynamic content. When Email Messages are sent from campaigns, Merge tags are dynamically populated with information based on the type of tag. There are two types of Merge tags: Recipient tags and Sender tags. Recipient tags represent data that belongs to the prospect receiving an Email Message. These tags are populated with standard and custom field data pulled from that individual prospect's record. For example, if you send an email that includes the [[First Name]] Merge tag, then an email sent to "John Smith" will have [[First Name]] replaced with "John" and an email sent to "Bob Jones" will have [[First Name]] replaced with "Bob". Sender tags represent data that belongs to the sender of an Email Message. These tags are populated with the contact information of the DemandCenter user that is designated as the sender. NOTE: Due to spam compliance laws, make sure your Email Message includes required elements to satisfy Email Regulatory Compliance. For more information, click here. For any given Merge tag, there is a possibility that data is blank. When this happens, you can provide Default Values for each Merge tag. This will spare you from having goofy Email Messages seemingly appearing to have "blank" spots. To illustrate, the image below contracts a Recipient Merge tag with and without a default value. In the first example, there is no default value provided for [[First Name]]. Thus, if a recipient was missing a first name, then the email will display "Dear ,". 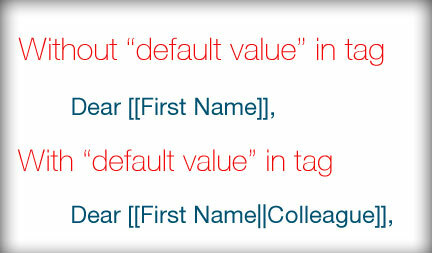 In the second example, the [[First Name]] Merge tag will be replaced with [[First Name||Colleague]]. The two vertical lines between "First Name" and "Colleague" act as a signal to DemandCenter that "Colleague" should be used as the default value for the [[First Name]] Merge tag. As a result, if a recipient was missing a first name, then the email will display "Dear Colleague,". When you add a Merge tag to your Email Message, you will be prompted to provide a Default Value for that Merge tag. Once you provide a value, the Drag & Drop Email Editor will take care of the rest and automatically add the special syntax. If you do not specify a Default Value when you initially added a Merge tag, you can add them later by opening your Email Message's Properties. Under Merge Tag Defaults, provide the the default values for each Merge tag. When creating lead alert templates, Merge tags can be used too! This allows for even more robust customization of lead alert templates. However, Merge tags inside lead alert templates do not support Default Values because lead alerts are meant to show data.